This New Year brings us exciting news. We worked to create a vision for the next 10 years for our company and part of that was building our restaurant properties to a place where we could own the land beneath our business. Along with that goal, comes many other desires for both creating a place where our staff can learn alongside us, and a place where our guests can come and relax for more than a meal. As we were working on these concepts, an opportunity arose. Our friends Isabella and John Molinari decided it was time for them to take a break from the business. We’ve known them for more than 20 years. We all operated restaurants on the same small island in Florida decades ago. When we first bought a second home in Blue Ridge nearly 15 years ago, we were excited to be able to escape to such a beautiful place. The only thing lacking in our visits was a food scene in the county. But we were happy to relax and cook at home. After a couple of years of traveling to town from Bonita Springs, Florida, my friend Lisa Mitchell told me about a new restaurant. It was Valentine’s Day and I wanted to surprise Danny with a dinner out. I must admit I smirked when she told me I needed reservations in Blue Ridge! But I jotted down the name of the new place – Cucina Rustica – and I called for reservations when I got back to the cabin. This loud New York voice came on the phone. I started to spell our last name M-E-L-L-M-A-N … ‘What!” the voice on the other end said. I started to spell it again and he interrupted, “Mellman? Danny Mellman.” I handed the phone to my husband and he and John began one of their normal loud conversations back and forth. Dinner, of course, was fabulous. And whenever we got to Blue Ridge without the kids we’d stop in and grab a bite. After a few years, we sold our restaurant in Florida. I told Danny he had to take three years away from restaurants. I continued running the magazine group I worked with in New York, and Danny began writing, traveling and catering. And then his restaurant bug came back. You can’t keep a chef out of the kitchen. Many of you know our story. Danny wanted to open again in Naples, Florida. I wanted to move to Blue Ridge. Somehow, my prayers were answered and our friends Randy and Janice Durden offered us the opportunity to create a restaurant downtown. And Harvest on Main was born. Never, in my wildest dreams, did I think I would somehow become so involved in Danny’s business. Now, our businesses. Never, did either of us imagine we’d be creating the vision that we now have for our restaurant group, our staff, our family and our community. But here you have it. John and Isabella have decided to retire (I am sure for just a moment or two) and we have been blessed with the opportunity to adopt their restaurant babies and add them into our growing family. As of Jan. 4, 2017, Cucina Rustica and La Pizzeria are now part of the Lit’l Pond Hospitality Group – joining their sibling restaurants – Harvest on Main, Masseria Kitchen+Bar and The Blue Ridge Fry Shop. Along with our 30-acre farm, the new property completes one portion our Vision 2027 plan. We are excited for John and Isabella. We are excited for our Group. We are thrilled to be continuing the traditions that John and Isabella have created both at Cucina Rustica and La Pizzeria at Cucina Rustica – from great food, to great family to great fun. They have created a destination and we are so inspired to be building on their vision and traditions. As fate would have it, we had also planned a trip to Italy with our Partner-Chef Ryan Beadnell to learn more about pasta, cured and aged meats, and traditional methods. We hope to inspire Ryan with the sense of place we feel when we are in Europe. We want him to find motivation in the emotion of days spent immersed in Italian life. We look forward to bringing all this new knowledge back to our group. And so, it is from a coffee shop in Parma, Italy that we write this note. It’s still crazy to imagine that just a few short days ago, we closed on the purchase of two new restaurants and then boarded a plane to Italy. Crazy and nerve-wracking juggling whether to stay open or close with a snowstorm headed toward our businesses. Fielding calls and e-mails, coordinating the call to close up shop and preserve the safety of our precious staff at all our locations. And so, we pause here in Italy and think of Isabella and John. We hope the snow gave them a chance to stop as well. I hope they are relaxing at home sitting by the fire celebrating the fact they don’t have to shovel the driveway to the restaurant or call all the staff. We hope that all our guests and friends in Blue Ridge are as excited as we are about our new family members. We hope the loyal friends of Cucina and La Pizzeria are thrilled for Isabella and John, and have no anxiety about our new role in their former business. We want only to continue what they have started. We welcome your advice, your friendship and your ideas. We are excited to have the Molinari’s talented staff join our team and we cherish each of them as well. Blue Ridge itself has continued to grow and developed into a creative landscape of food and art. There are breweries, wineries……. The train continues to entertain, but a wealth of additional outdoor and indoor attractions have come to fruition that continue to build and strengthen the economy of the region. The old town main street continues to thrive along with the outdoor adventure area- but the food and art scene is building and driving the new growth and customer-base. Terre Madre is the center of the energy. Our properties evoke a sense of place. Our central location is reminiscent of a small, town center with gardens, chickens, bees and entertainment. Guests come for the experience of not only great food and great service, but to connect their food to a sense of place. And that is what we see for ourselves, for our business family, for the county, and for all of you – our friends. I sit, watching the sky darken, and contemplate the task of mucking out our sow’s stall. I need to dispose of the straw she’s kept so warm for her litter this winter, the lice have not died off despite bone-chilling weather. I’ve finished my basic daily chores. I revisit the list in my head. Quail, fed, watered, eggs collected. Rabbit’s hutch cleaned. 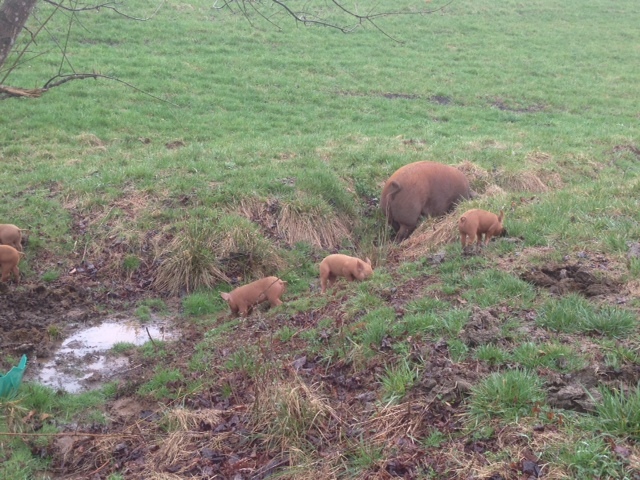 Now the doe h as some space to run from her growing 4-week old litter. Fed, watered and collected eggs from the chickens. Fed watered and collected eggs from the geese. Inside the house, the eggs get piled up in a basket; quail eggs and chicken eggs separately. 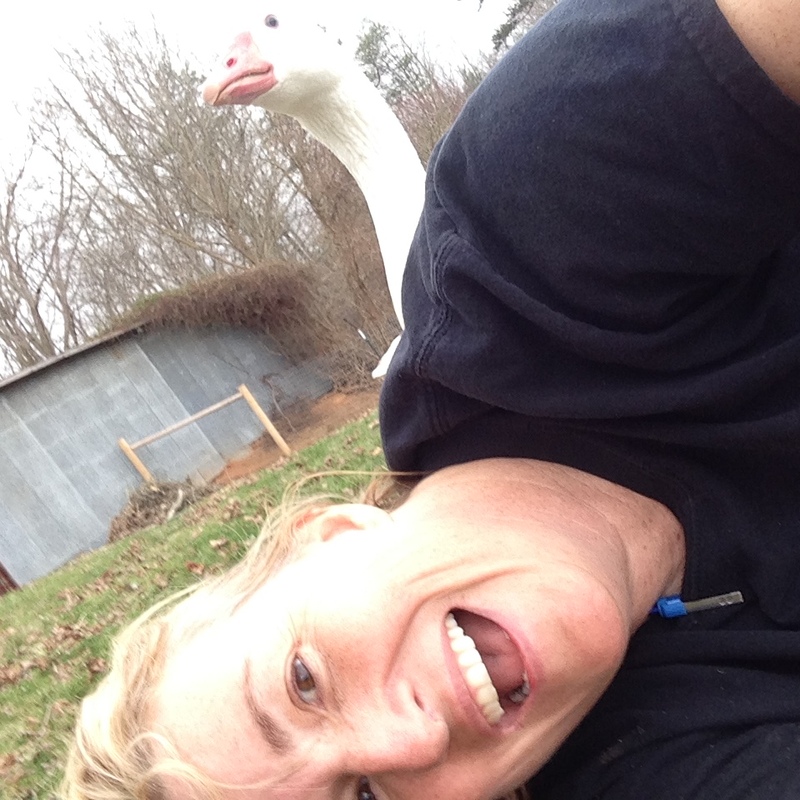 Goose eggs go to the garage for incubating, although today I pack a half-dozen to send to a friend in Louisiana to hatch under one of his broody Cotton Patch geese. Just as I close the package for shipping, I hear a commotion from the geese. I glance out the window expecting them to be in the pond mating. I can barely see the tops of their heads pointed down and straight out chasing and yelling at something. Slipping back into my boots I run down the hill to chase away whatever predator might be there only to discover one of my ganders tearing into a hen. He simply hates the chickens and during nesting season his fervent hatred of them only grows. I gather the hen, take her to the barn and make a nest for her near the quiet rabbits and quail so she can rest and recover. And then the rain comes. I don’t feel like mucking a pig’s pen in the rain. I decide to procrastinate and do the office work piling up on my desk instead. A normal day on the farm. When we moved to Blue Ridge full-time six years ago, my husband Danny and I believed there would be a wealth of farmers ready to quench the unending thirst of our restaurant for fresh product. As it turns out, that wasn’t the case. So I began to look more fervently for some space to plant heirloom produce and specialty herbs. We happened upon a small 1.5-acre parcel in town and turned into a sustainable homestead project to illustrate what anyone can do in their own backyard. It’s a great testament to the fact you don’t need 40 acres, or even 10, to have a homestead. Even a small acreage such as 2 or 4 acres can provide for a family. The Cook’s Farm, as we aptly named it, is a good example of what you might call an urban (or suburban farm). It’s a small footprint, but produces enough product on its ½ acre garden to supply specialty items to the restaurant, feed kids during our 2-weeks of Farm-to-Fork camps in the summer, and have some extra to spare. Our chickens keep the classes, family, and CSA customers in farm fresh eggs. My idea of homesteading is committing to self-sufficiency on whatever level you are comfortable. For us it encompasses growing and preserving food, specifically growing and saving heirloom seeds. I focus on raising animals on the American Livestock Conservancy List – breeding for meat while preserving the longevity of the breed. Ultimately we’d like to provide our own electricity with solar or wind. I will probably never make my own fabric or clothing, but some homesteaders take the self-sufficient moniker to that end as well. Ours is a more measured approach – one that fits within our lifestyle and abilities – which I believe is one of the most critical parts of homesteading. Diving in without testing the waters is a recipe for disaster. Chickens are a great place to test your skill set and desire. It’s where I began, researching how to build a coop; chicken attributes (layers versus meat chickens); and how to care for chickens. I was immediately hooked. Be sure to find out your local laws to make sure it’s legal, and then determine whether you have the patience for baby chicks or want to start off with pullets or hens. Honeybees are another great project for a small farm. Other than the investment in equipment and seasonal tasks, they are very self-sufficient. The change came for larger scale production after we were gifted with a Duroc pig for the holidays in 2013. As little Noel grew into a 200-pound gilt, we knew it was time to find a bigger space. And we definitely needed to find one outside the city limits (it’s never a good thing to get a call from the neighbors to let you know your pig is heading down to Main Street). Now we have a 28-acre parcel, slowly making the transition from the space downtown. Here, we make our own cheese, can our produce, gather our own honey, save our own seeds, and preserve our own meats. I have learned how to give an injection; hatch out chicken, duck and goose eggs; I know how to break ground and plow; how to make a cold frame; how to install an electric fence; and how to deliver and nurse piglets. We make our own sausage and hams, gather our eggs, and grow our own produce and herbs. Of course all the best product goes to the restaurants first, and the remainder is used at home. There are plenty of things on my ‘learn to-do list’ that I will need to know with the new farm. The first on my list is to train a guard dog for our poultry and geese. 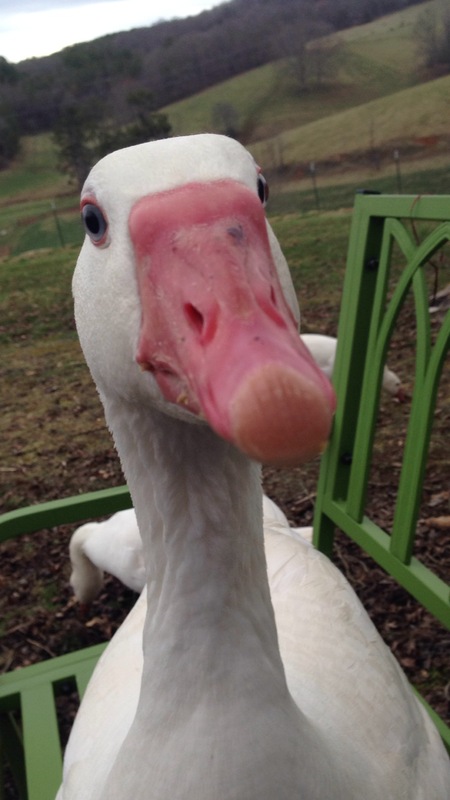 We lost two of our Cotton Patch Geese the first month – a blow to my spring breeding program with the American Livestock Conservancy rare breed. I don’t really have the desire to learn how to butcher small livestock like rabbits or chickens, but luckily that side of the equation is addressed by Danny or I can trade services with friends. One thing that homesteading has taught me is how to swap, barter and network with like-minded individuals. It’s always great to meet someone with a boar to mate with your sow; or someone who want to raise the same rabbits so we can track and trade breeding stock. I would like to learn the differences between trees and the unique properties of various types of wood, something my husband can readily do. We’d both like to learn how to witch for water with a forked branch or a bent metal hanger (not really at the top of the list but a cool skill nonetheless). I’d also really like to learn how to rea d an almanac and to milk a goat. I really need to learn how to set an ear tag or tattoo for animal identification. I have the tools just not the heart for it yet. One skill homesteading has truly given me is the mental and spiritual skills to realistically deal with life, death and failure. That’s something no career or relationship has ever taught me so completely. Items I treasure (aside from my family and animals)? I have to say, my very own tool set – including my own drill (which was my favorite Christmas gift this year). Now, I really need to learn how to properly use the rest of the tools in our basement. Well, that can wait until the rain passes.